Groundswell Activists and the occupied banner drop. Nicely done. Two female activists from environmental direct action group Groundswell have taken peaceful action to highlight the detrimental impacts that mining in the Tarkine will have on healthy devil populations living in the region. At 10AM on Saturday, Feb. 2, Groundswell activists deployed a banner reading “FOR DEVILS SAKE, DON’T MINE THE TARKINE” from the Alexandra Suspension Bridge, in Launceston’s Cataract Gorge. The two climbers– a local law student and a doctor- remained suspended from the bridge for two hours until 12pm. “The Tarkine region of North West Tasmania contains the last wild populations of disease free devils. Mining and associated activities are of significant threat to the devils of this region” said Groundswell spokesperson Sarah Van Est. “A further threat is the substantial increase of heavy traffic in the area, which would greatly increase wildlife roadkill” added Miss Van Est. 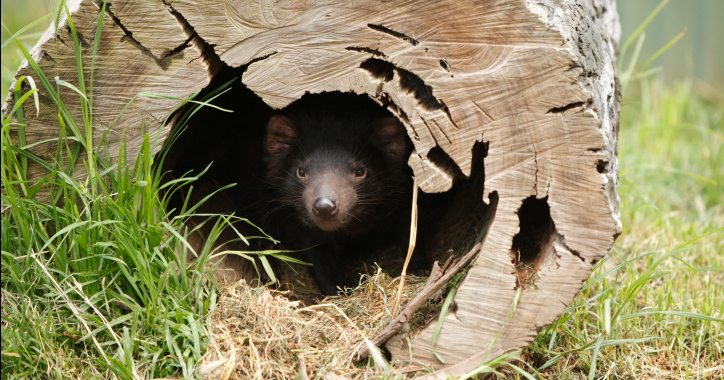 A leading wildlife expert, Prof. Hamish McCallum, head of Griffith University’s School of Environment and former chief scientist of the Save the Tasmanian Devil Program, confirmed that the mines would have a potentially disastrous impact on devils. “There is sufficient evidence to suggest that it may threaten the survival of populations of Tasmanian devils in the area,” said Professor McCallum. As well as containing significant devil habitat, much of the Tarkine has already been independently verified as high conservation value wilderness. Groundswell is calling on the State and Federal Governments, specifically federal environment minister Tony Burke, to safeguard the area and the devils by ensuring immediate and ongoing protection in the form of National Park or World Heritage List status for the Tarkine region.